There is nothing refined about killing, but the war in Syria has shown that both sides have resorted to improvisational tactics. I say ‘both sides’ as a short-hand: this is hardly a two-party conflict, since the anti-Assad forces are far from united and a number of external powers – not only Iran and Saudi Arabia – are plainly using the parties as players in a proxy war. One of the first signs was the Syrian Air Force’s use of so-called ‘barrel bombs’: in effect, these are improvised explosive devices made from oil barrels filled with crude explosive and, on occasion, metal shrapnel and even chemicals like chlorine, which are then dropped from helicopters. At first, they were dropped from low altitudes – which, according to Richard Lloyd at least, made them accurate enough to strike particular targets – but once the rebels were equipped with rocket-launchers (MANPADs) the helicopters had to fly much higher (near 7,000 feet) with a corresponding diminution in accuracy. 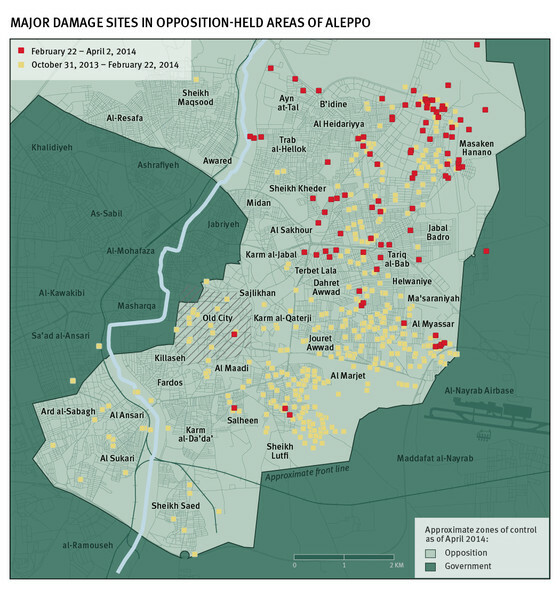 The first attacks took place against the city of Homs in August 2012, but the locus then shifted to rebel-held areas in Aleppo – the map below comes from Human Rights Watch‘s forensic analysis of strikes against that city between October 2013 and April 2014; some of the sites identified may have been struck by other munitions, HRW concedes, including conventional bombs, mortars and artillery shells, but the vast majority reveal the characteristic signature of the indiscriminate deployment of barrel bombs. The Syrian National Council estimates that 20,000 people have been killed by barrel bombs thus far. The result has been captured in a sobering video from Syrian Zero, showing barrel bomb attacks on Darayya, a neighbourhood in Damascus during the last week of January (below; you can find a brief, helpful exposition and commentary on the video here). Barrel bombs have also been used by the Sudanese Air Force in Southern Kordofan and Blue Nile states, and most recently by the Iraqi Air Force against Fallujah. According to the BBC the explosion, just outside the Citadel, levelled the hotel and seriously damaged many surrounding buildings; there has been no official estimate of casualties, but it seems that dozens were killed or injured. In the last few days a much longer (850 metre) tunnel, which reportedly took 7 months to excavate, was used to detonate 60 tonnes of explosive packed under a Syrian Army base at Wadi al-Deif, also in the north of Syria. The base, outside the town of Maarrat al-Nu’man, occupies a strategic location on the main route linking Damascus and Aleppo, and had been besieged by rebel forces for over a year. Dozens of soldiers were killed in the attack. Tunnels, then, can be used not only to break sieges and blockades – as in those that keep the economy of Gaza supplied against the Israeli stranglehold: in effect, lifelines (if you want more on this, try the brilliant documentary Gaza: Tunnels to Nowhere and Nicolas Pelham, ‘Gaza’s tunnel phenomenon’, Journal of Palestine Studies 41 (4) 2012, pp. 6-31). They can also be deathlines, dug for directly offensive purposes. 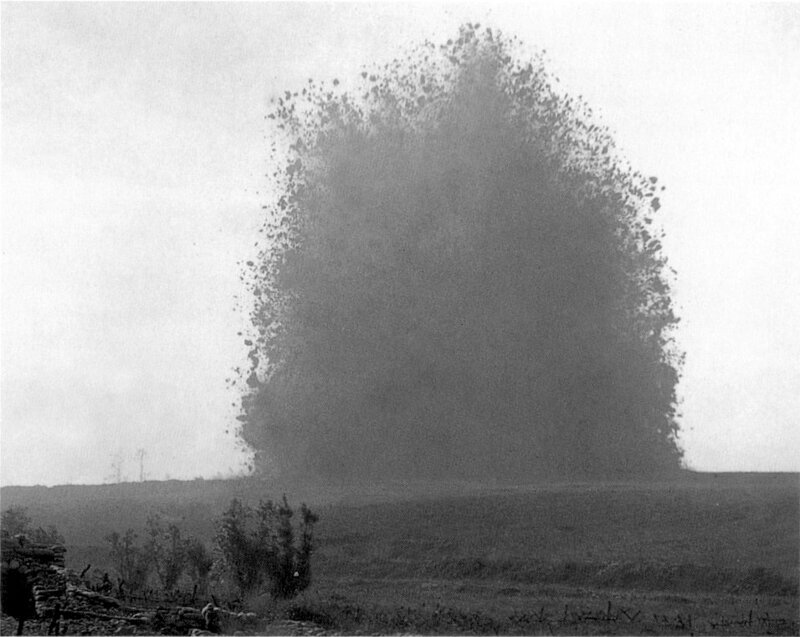 The tactic had been used to devastating effect on the Western Front, as I noted in a previous post on 3-D war: the image below is Ernest Brooks‘s famous photograph of the detonation of the British mine underneath the German lines at Hawthorn Ridge on the first day of the Battle of the Somme on 1 July 1916. You can find video of the explosion here. Then as now, as Jane Burgess argues in a dispatch from the frontlines of ‘The Battle for Aleppo’, they are deadly improvisations in a war of attrition. Both of these developments/reversions – the barrel bombs and the mines – obviously reinforce Stuart Elden‘s discussion of attempts to ‘secure the volume’. But they also speak directly to a bleak politics of insecurity. This entry was posted in arms and weapons, bombing, Syria, World War I and tagged barrel bombs, mines, Syria, tunnels by Derek Gregory. Bookmark the permalink.